1. Titanic struck the iceberg at 11:40 pm ship time on 14 April 1912. The night was moonless and the sea calm with temperatures at or below freezing. Titanic was moving quickly but did not see the iceberg until it was nearly upon them. An attempt to steer around it resulted in a collision on Titanic’s starboard side. The iceberg would puncture Titanic enough so that the first five compartments would flood. Since the compartments were not totally sealed all the way up, water would go from one compartment to the other making her sink at the bow. 2. Titanic would transmit signals by wireless telegraph, Morse lamp, and rockets. The ship nearest by most accounts was SS Californian. Her telegraph operator turned off his equipment at 11:30 pm and never heard the distress calls. Questions linger to this day whether or not they saw Titanic or her rockets being fired. The RMS Carpathia received the SOS and its captain, Arthur Rostron, immediately ordered to proceed directly to the last known coordinates to locate survivors despite having to navigate a dangerous ice field on a moonless night. 3. Titanic would sink on 15 April 1912 at 2:20 am. 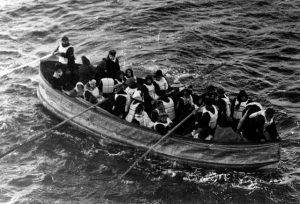 Although Titanic met the British Board of Trade regulations and exceeded it for the number of lifeboats required, it did not have enough for the full complement of passengers and crew. As a result over 1,500 men, women, and children would had no means of escape from the sinking ship. 4. Carpathia arrives at 4:10 am to rescue survivors who were in lifeboats or able to reach them. 710 survived the initial sinking but the final tally would be 705 due death from freezing cold. SS California would arrive later but would find no survivors. At 12 noon Carpathia sounded her horns and began heading back to New York. * It was the moment that many wives knew for certain their husbands had perished. *SS Carpathia was on her way to Fiume then part of Austria-Hungary in the Adriatic Sea. Today the city is Rijeka and major city in Croatia owning to its deep port and cultural significance. And news reports indicated Titanic was being either towed to Halifax or to New York. It turns out though that another ship in distress, an oil tanker being towed to port, got mixed in with reports about Titanic. Wireless messages were constantly being bounced about, were often short, and since Morse code was used easy to mix up things before sending the message forward. And that is what essentially happened. The New York Times was the first to report it correctly. 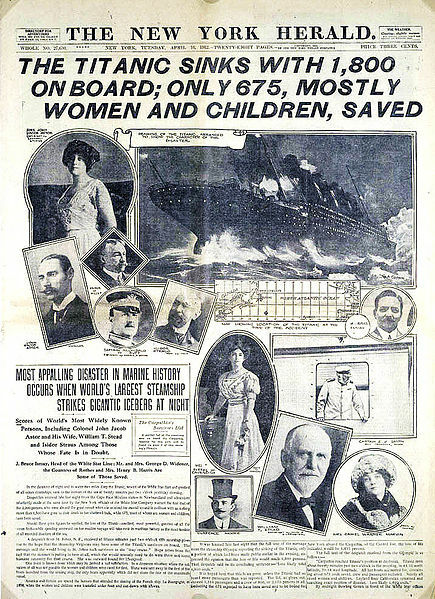 After three days of listening to messages and doing research, managing editor Carl Van Anda realized that no messages had been transmitted by Titanic since its distress calls. 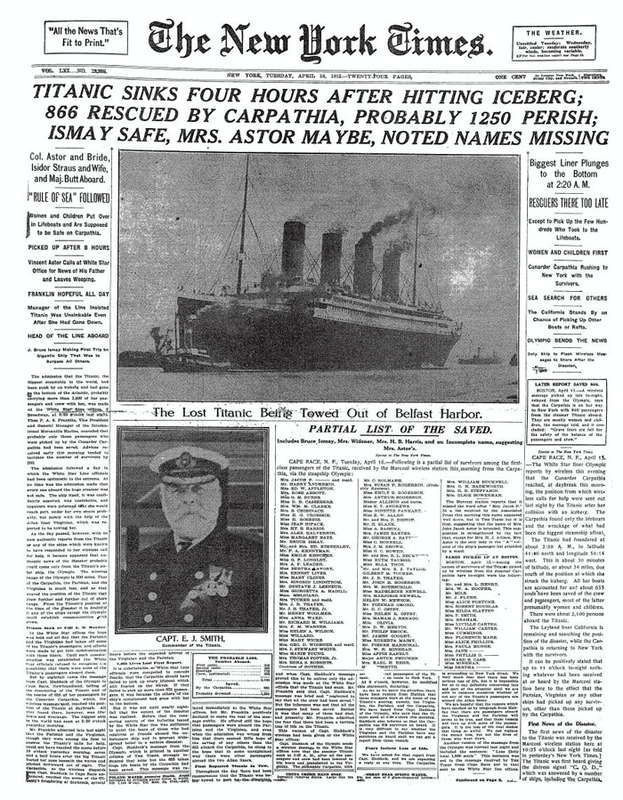 Their late edition would read:NEW LINER TITANIC HITS AN ICEBERG;SINKING BY THE BOW AT MIDNIGHT. Other newspapers would be forced to report it as well. 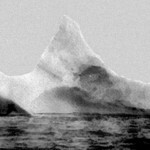 In April 1912 the unthinkable happened: Titanic sank taking over 1500 lives to the cold North Atlantic. People were stunned. With the headline Titanic Sunk blazing across newspapers around the globe, it made people wonder what had happened to a ship that defined an age of progress. For those with family, either passengers or crew, it was even more dire. Did my husband live? What happened to that family down the road that decided to go to America for a new life? In the aftermath two investigations would seek to answer the question of what happened. A short concise statement is that Titanic collided with an iceberg that punctured the hull in many places causing water to enter the forward compartments causing her to founder and sink. Yet the investigations showed all kinds of things that were not right: out of date government regulations about lifeboats, the lack of manning wireless communications during all ship watches, the inattention given to numerous ice warnings, the lack of binoculars for the lookouts and much more. Captain Rostron of Carpathia would be labeled a hero for racing to the scene and retrieving the survivors. Captain Lord of California would come under criticism for his indifference to rockets being seen and failing to investigate. The world of 1912 was a world on a precipice. Ominous clouds were already gathering over Europe. Titanic represented perhaps the pinnacle of the dying Edwardian age. It had everything that a person of means wanted: a comfortable way to cross the Atlantic in style. Down below was the other side, immigrants desperate to leave home and find a new life in the United States. And sadly many of those third class (or steerage as they were called)would perish. Titanic sinking left a mark on many that something was wrong and would be confirmed when war broke out in 1914. And that war would cut a wide swath in the upper classes that would have lasting effects. The lessons of Titanic are many. The most important of all is to never become complacent nor think you are so clever as to be divine. It is a lesson that is sometimes forgotten resulting in tragedies like the Challenger explosion. Sometimes Greek mythology delivers warnings about complacency. Icarus forgot his wings were made of wax when he flew up to the sun resulting in his death. And saying Titanic was practically unsinkable comes pretty darn close as well. 2. Titanic would transmit signals by wireless telegraph, Morse lamp, and rockets. The ship nearest by most accounts was SS Californian. Her telegraph operator turned off his equipment at 11:30 pm and never heard the distress calls. Questions linger to this day whether or not they saw Titanic or her rockets being fired. The SS Carpathia received the SOS and its captain, Arthur Rostron, immediately ordered to proceed directly to the last known coordinates to locate survivors despite having to navigate a dangerous ice field on a moonless night. 3. RMS Titanic would sink on 15 April 1912 at 2:20 am. Although Titanic met the British Board of Trade regulations and exceeded it for the number of lifeboats required, it did not have enough for the full complement of passengers and crew. As a result over 1,500 men, women, and children would had no means of escape from the sinking ship. 4. 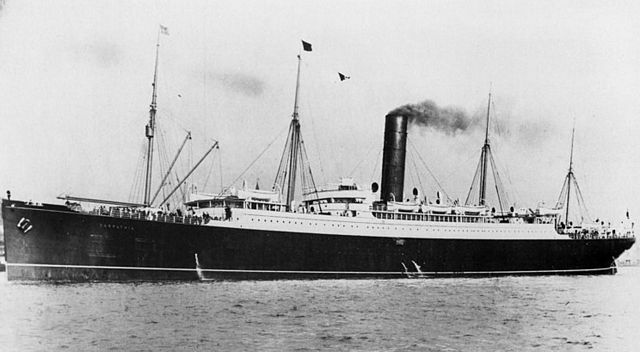 SS Carpathia arrives at 4:10 am to rescue survivors who were in lifeboats or able to reach them. 71o survived the initial sinking but the final tally would be 705 due death from freezing cold. SS California would arrive later but would find no survivors. At 12 noon Carpathia sounded her horns and began heading back to New York. * It was the moment that many wives knew for certain their husbands had perished. Whatever Happened To….Lord of Titanic? 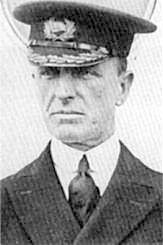 Prior to sinking of Titanic, Stanley Lord was a well regarded ship master. He had started out at age 13 and by 29 given command by the Leyland Line. Considering that most ship masters had to wait till near fifty years of age for a command, it tells you he was considered extraordinary. Some even say that by 1912 he was more experienced that most of Titanic’s officers (Captain Smith excluded of course). But at the end of both American and British inquiries, the conclusion was that he could have done more. Discrepancies in the respective ship positions could not be reconciled resulting in doubts about Lord and his officers. While neither inquiry recommended any legal action be taken against him, the damage to his reputation had been done. He asked for a hearing to bring witnesses and submit evidence before the Board of Trade. He was denied. Though the Leyland Line had supported him (and provided evidence that his reported position was backed up with wireless messages)he was asked to resign. Fortunately the owner of the Nitrate Producers Steamship Co, John Natta, was sympathetic and offered him command of a ship. He would work for them from 1913-1927 when failing eyesight forced his retirement. From then on he disappeared from public view until the 1950’s. First the publication of A Night To Remember in 1955 rekindled interest in Titanic and depicted Lord in a very unsympathetic life. The 1958 movie of the same name did the same. He sought assistance from Mercantile Marine Service Association(MMSA) and its general secretary, Leslie Harrison took up his case. Lord though passed away in 1962 at age 84 not knowing if Harrison’s efforts would result in anything. Harrison’s two petitions for a new hearing were twice rejected by the Board of Trade. Harrison’s book A Titanic Myth lays forth the case for Lord’s defense he was never able to give. Titanic was found in 1985 and its position showed that Titanic fourth officer Boxhall had miscalculated the ships SOS position by 13 nautical miles. This was significant since both inquiries discounted any discrepancy of Titanic’s position and held that Californian’s position was in error. Eventually the U.K. Marine Accident Investigation Branch (MAIB) was asked to reappraise the role of SS Californian in sinking of Titanic. The report was issued in 1992. While those undertaking the report differed on whether Titanic was seen by Californian, they were unanimous that Lord’s failure to take action when rockets were sighted was wrong. While rockets had other uses than distress, it ought to have been investigated with the ship’s wireless operator awakened to find out what was going on. Why this was not done remains unknown. Note the use of the word “martinet” to describe Captain Lord. That word is not used much these days but instructive on what people of his day thought of him (and today when they read what others said about him). To call someone a martinet is to describe someone who demands strict adherence to rules and doles out punishment for those who fail to follow them. And Lord was strict on following the rules and you did not break them for any reason lightly. It is a partial vindication for Lord. It absolves him of providing a false position of California nat both hearings. It does not absolve him or his officers of doing nothing. While the outcome might have been the same, at least attempting to investigate the rockets (by waking the wireless operator and finding out who was sending them up and why)was preferable to either being indifferent or unconcerned that people may be at peril on the high seas. Relating to SS CALIFORNIAN,page 17. 2:20 a.m.: Titanic sinks with over 1,500 souls lost. 0400: Carpathia arrives and begins recovery operations of lifeboats. Dawn reveals large icefield and some bergs 200 feet tall. 0730: Californian arrives but only finds Mount Temple. Sights Carpathia. 0830: Carpathia and California alongside. Carpathia requests she continue search for survivors. Californian only finds debris. 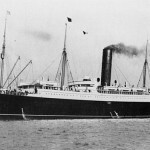 Carpathia departs for New York. 10:40-11:20: Californian gives up search and departs. Discrepancy between log and Third Officer Groves makes time approximate.